And while webpagesthatsuck.com has yet to add Twitter to their suckiest favorites, there are plenty of users out there who have voiced their opposition to the redesigned pages. 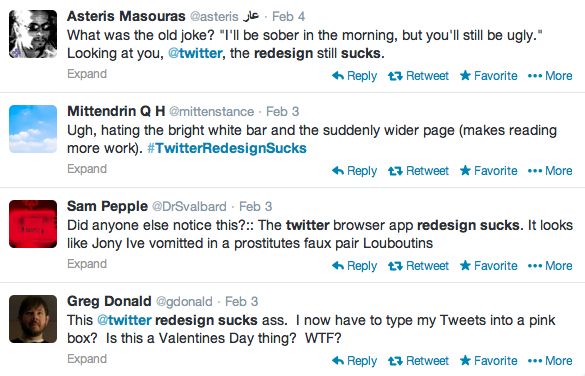 While Sophie Murray-Morris called the redesign “cleaner” when it was originally unveiled in January, others have not been so kind. “I’ll be sober in the morning, but you’ll still be ugly,” joked @asteris. Of course, change is always difficult, and even as the Twitosphere heckles itself about bright white bars and pink Tweet boxes, the hecklers are using the very medium they are complaining about. It’s like they are yelling at their wives for having ugly children. But for new users accessing the service for the first time, many of them stop midway into the sign-up process, giving up after their 60-second tutorial turns into an exercise in complexity. Whatever happened to sign me up and go? Philip Pearlman called the signup process “tortuous” and “shockingly bad”. While the user interface engineers scratch their head over at Twitter, website managers everywhere could take a simple lesson from it all. Customer testing, customer testing and more customer testing. At least go public with the designs before releasing them, gathering buy-in from a select list of users who can later help defend the improvements. We will all face the client and customer who will complain about the new design being worse, but with a list of improvements next to concrete user testing statistics, the fallout resulting from redesigns can be mitigated. Thanks for recognizing the importance of good design! It costs this country billions in lost productivity. Good design = happiness! Watch the stop pop back next week, then what will you say? Just joined Twitter on iPad… Could not add profile photo… Took an hour to “tweet” and don’t know if it reached @midnight … I’ll bet they have some guru advocating bootstrappy dumb-down minimally-functional MVC razor architecture at Twitter central. Horrible UX!